We Welcome You Back for Proctor Reunion 2019! 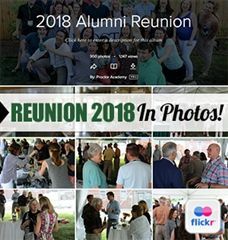 Reunion weekend brings together alumni, family and friends for campus tours, golfing, faculty led classes, live music, dancing, polar swim, relaxing at Elbow Pond, meeting old friends and making new ones. For more information or to help get classmates to attend, please contact Chloe Duchesne, Director of Alumni Relations, at alumni@proctoracademy.org or call (603) 735-6867. We invite alumni and families to stay in a dorm on campus or at local lodging; Rooms are limited both on and off campus so register early. Contact Debbie at 603-735-6721 or events@proctoracademy.org. Click HERE to see who's attending reunion.